RGV Killer Bees' Patrick Sullivan during practice as they prepare for the start of USACHL season at practice in State Farm Arena on Wednesday, Oct. 24, 2018, in Hidalgo. McALLEN — The ice is frozen in Hidalgo and the Killer Bees are back in the Rio Grande Valley for a third iteration of the region’s hockey team. Tonight the Bees will return to action against the Laredo Bucks, an old-time rival that also had new life breathed into a dormant franchise when the USA Central Hockey League announced its formation about a year ago. Fans of the quick-paced sport will have games in their back yards once again and the four-team league even sent down another set of local friends. The Texas Lawmen will operate and compete out of McAllen’s Frio Grande Ice Center, giving fanatics twice the ice to get their puck fix. 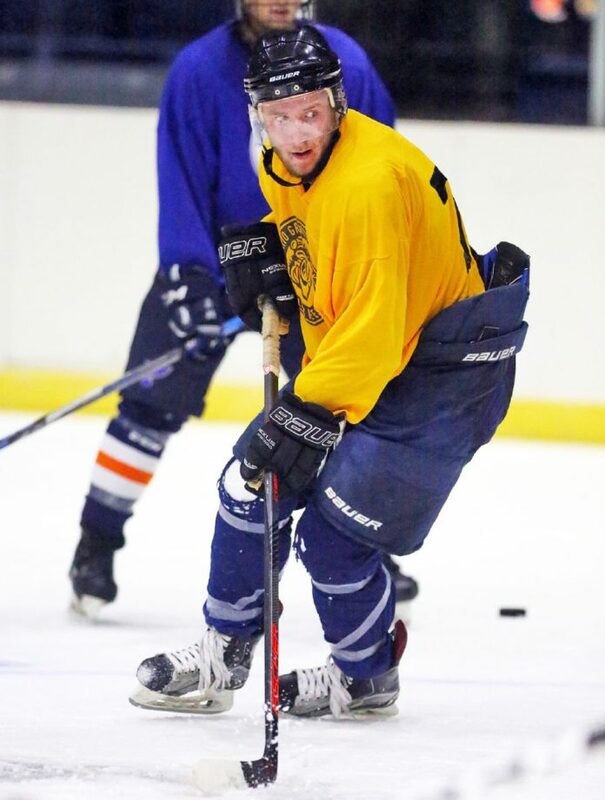 The four-team junior hockey league drops the puck for the first time tonight and the anticipation is turning to competition for the 16 through 20-year-old players who are set to get back to their passion. Each young man’s route to the league was unique. Pennsylvania native and defenseman Patrick Sullivan made a last-minute change to take the leap of faith. The USACHL is similar in name to the Central Hockey League, which is where the original version of the team played from 2003 to 2012, but that league merged with the East Coast Hockey League. Instead it will more closely resemble the NA3HL, which was another junior league that the Bees played in four two seasons before relocating. The rules mostly emulate the professional game, meaning fights are allowed which is something unique to a modern junior league. That’s a prospect that had the physical defenseman grinning. Sullivan is not the exception among the young players who landed in the Valley along a winding hockey road to try to advance their careers and stay on the ice in a competitive environment. Lucas Radina a Czech Republic native, has played in North America for the past five years. He has made the adjustment to the style of the game that has many European-based players making the move to try to crack the top NA leagues. Even though there are Czech players who have made a huge impact in the National Hockey League, Radina’s role model in the highest level of hockey is an American Olympian. Wearing the “C” for captain will be Dominic Dumas, an Idaho-born forward who has played most of his junior hockey in the British Columbia Hockey League in Canada’s Pacific province. “I played in juniors last year up in Canada so I guess I have the most experience at the highest level so far,” Dumas said about how he earned the captaincy. Even though he’s one of the newest players to the area (he arrived two weeks ago), he’s hoping to see fan support and share the new experience with fans hungry for the sport’s return. One constant that hasn’t changed about the players who have sat on the bench in Hidalgo, whether the team is semi-professional or amateur, is the passion.